- ‎Perfect mix of Pmma, collagen, crosslinked hyaluronic acid large particles, and lidocaine. Designed to add volume beneath the skin’s surface to lift and contour the cheek area. It Smooths moderate to severe parentheses lines and folds. 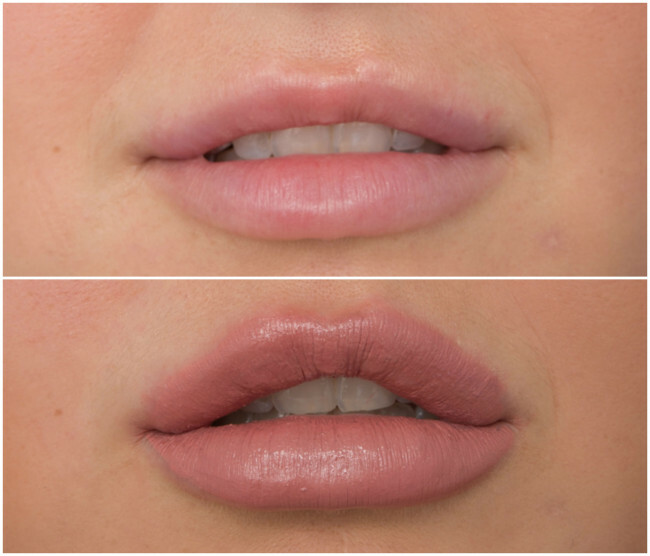 Soften moderate to severe facial lines and wrinkles, and adds fullness to the lips. ACQUADERM® is a filler that provides instant and definitive corrections, used to treat facial wrinkles, cheek, malar, chin and jaw augmentation, nasal tip elevation, nasal defects correction, nose surgery sequel, any underdevelopment or atrophy of fat facial layer, lip augmentation, hand dorsum correction secondary to age, penile augmentation, inferior limbs contour correction and several others indications, including another areas than plastic surgery, as vocal cords defects, urinary incontinence in woman. Unlike collagen, ACQUADERM® has no waiting period for allergy testing. 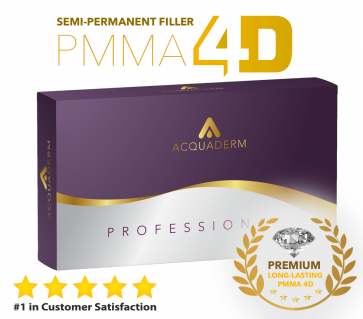 Studies also prove that ACQUADERM® PMMA 4D benefits are permanent avoiding endless visits to refill the area expanded. It is stable in normal temperatures and does not need to be kept refrigerated. It is biocompatible, non-absorbable and provides permanent correction of any depression in any part of organism introduced. To implant ACQUADERM® is easy, safe, painless and can be done as an ambulatory procedure. - The specifically-formulated suspension base ensures that product remains where it has been placed. - 9 out of 10 patients reported less pain when treatments were performed using fillers which contain Lidocaine. PMMA is indicated for the correction of nasolabial folds and moderate to severe, atrophic, distensible facial acne scars on the cheek in patients over the age of 21 years.Patients who have had a positive reaction to the Skin Test, have a history of severe allergies, have known bovine collagen allergies, are allergic to lidocaine, have bleeding disorders or are prone to thick scar formation and/or excessive scarring should not receive PMMA. The safety of PMMA for use during pregnancy, breastfeeding, or in patients under 21 has not been established. You may experience temporary swelling, redness, pain, bruising, lumps/bumps, itching, and discoloration at the treatment site. These side effects are usually transient and typically resolve within 1–7 days. You may experience lumps/bumps/papules that may occur more than one month after injection and that may persist. Less common side effects include rash and itching more than 48 hours after treatment, persistent swelling or redness, lumps/bumps, acne, and increased sensitivity at treatment sites. Infrequently, granulomas may occur and may be treated by your licensed physician provider. Be sure to call your licensed provider immediately if you notice any unusual skin reactions around the treatment area. Based on the 5-year Post Approval Study on nasolabial folds with 1,008 patients, the long-term safety of PMMA for up to 5-years has been established.